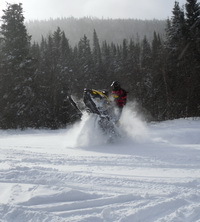 Why not include Bosebuck Mountain Camps in your Snowmobiling Plans this winter? We are directly on the trail (ITS 84) in Maine on the NH border, approximately midway between Pittsburg, NH and Rangeley, ME. We provide overnight lodging, gas, food (breakfast, lunch, dinner) and ME snowmobile registrations. The facility is at an elevation of about 1600 ft in the heart of the Maine/NH snowbelt. Due to the elevation and mountain effects, it often snows at camp everyday. It is not uncommon to experience white-out conditions at camp while it is sunny in Rangeley, Errol and Pittsburg. Be sure and watch our Web Cams and see for yourself. At Bosebuck, you are already in the heart of the best riding there is. So, just bring your sleds and be ready for a unique experience like none other.